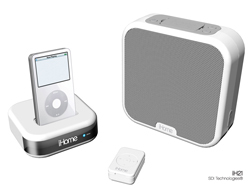 If streaming your iTunes music via Airport Express isn't for you, then perhaps the iHome iH21 is more your fancy. Consisting of a dock and matching speakers, the iH21 let's you beam your tracks to the basement, the kitchen, and even your bedroom. Plus, the speaker is water-resistant and remote control-friendly, meaning your music's safe even during your wet and wild orgies. Too bad the same can't be said of the rest of your furniture.